I still go to Zam for quest info, if only because most of the older quest data is still correct and they have a nice little button setup to copy waypoints in the format that you can just paste into chat in order to get the wisp. I understand that Zam itself is trying to turn itself into something of a Polygon clone. At least one blogger I know has been hired to write for it. But its old life is no longer the focus. Another gyration in the life of that site that was once THE place to go for EQ information. I have something of a mixed relationship with EQ2Map. When I have it installed I tend to find it a bit annoying as there are often way too many POIs on the map to be able to find anything, or even click on that one POI you want in a sea of competing icons. On the other hand, without it installed, as you note, the map feels very, very bare bones. So I keep it installed. 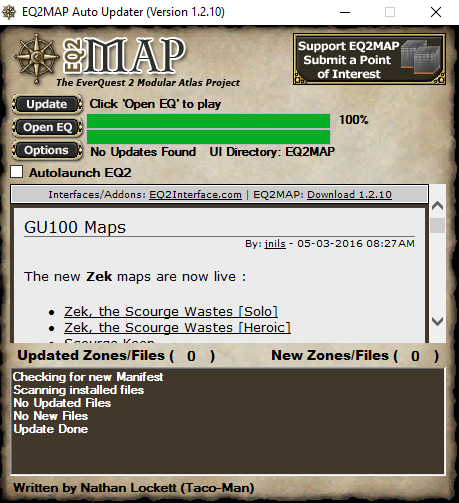 Yes, EQ2Map can be cluttered, what with everyone adding POIs for things they think are important but no-one else does. What I mostly do is cut and paste the locs from the wiki into the search line on the map. That makes questing a lot more enjoyable. The Zam click thing would be good but I have to keep resetting No Script to use that and it's more trouble than it's worth. With Zam's chequered history I don't feel like whitelisting it. Once again, a timely and pertinent blog post! I had a situation this past weekend where my investigative skills and my understanding of the intricacies of EQ2 were not equal to the task, and missed an opportunity that I understand may not come around for another couple of months or so. I had previously noticed the nifty backpack in your screenshots, and having checked Google images from a search was able to identify that it was the impressive 66 slot Naylie's Nebulous Newsbag. 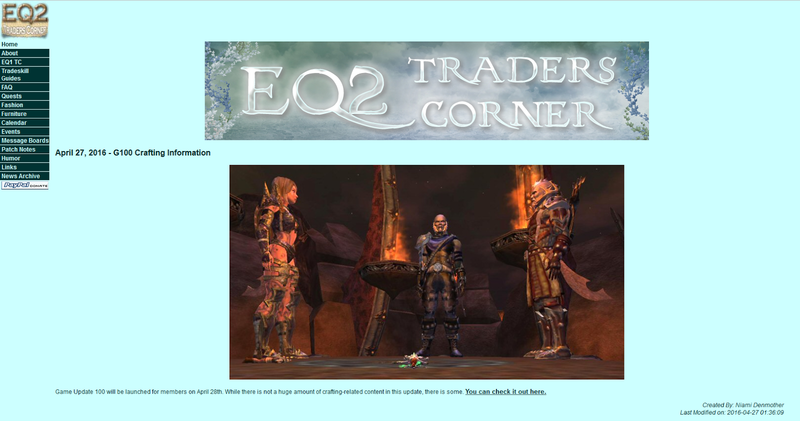 I then read the quest entry on the EQ2i wiki but failed to recognize that "Speak to a Guide" and "The guide is not always there" is EverQuest 2 lingo for an actual live GM person who is an extremely rare spawn that evidently only appears every couple of months or so at a pre-arranged time posted on the official EQ2 forums! They put in an appearance yesterday, but not being "in the know" I did not schedule my activities around their arrival and so missed my chance at picking up the quest that starts the chain, alas. I'm familiar with PvP'ers having content & rewards that are designed and restricted to them, as well as raiders having content & rewards designed and restricted to them, as a questaholic I'm surprised that there is a "rare spawn" questgiver that only "spawns" every couple of months and requires knowing in advance when the spawn will occur and being there at that exact time & place! If you're online when the guide appears to do the Newsie quest, and assuming you have General or Crafting chat open, people will usually call it. I've seen that a few times. Of course that doesn't help if you don't happen to be playing at the time. EQ and EQ2 both used to have very active GMs and Guides. It's something that rarely gets mentioned these days but for the first few years I played MMOs, ad hoc events hosted by either paid employees or volunteers were a commonplace of the genre. EQ was infamous for having GM event that got people killed and with the harsh death penalties back then players would often be in a hurry to leave the area when one started rather than head towards the action. 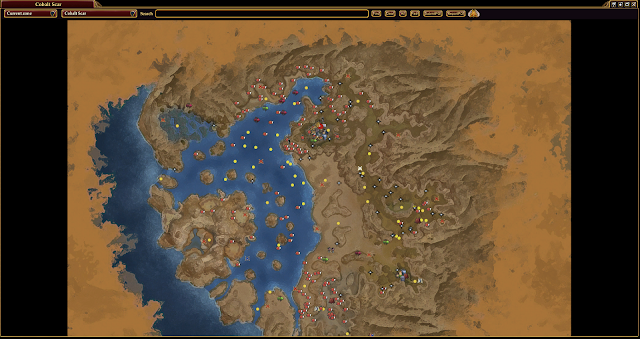 I think EQ2 is about the only MMO I play that still has a vestige of those kind of unscheduled, human-driven events. It is a great backpack too - worth making the effort to be there if you get the chance. "It is a great backpack too - worth making the effort to be there if you get the chance." I wonder how frequently the GMs handed out the initial starting quest when the content was new and fresh? Perhaps after it is no longer quirky and cute they could implement an NPC as the quest giver for those of us who come along late to the party? I tried searching on YouTube to see what was special about this "event" that benefits from GM involvement, but my search skills did not reveal anything. I'm left perplexed that whatever it is that the GM does is not better handled by a questgiver with a cutscene. I know that for me that when I logged on last night and learned that I had missed the unique opportunity to pick up the quest for perhaps a couple of months that it took the wind out of my sails. I had earlier visited a Mariner's Bell to investigate the quest area, and came away with the understanding that it would be a bit before I was the appropriate level to pursue the quest. But the feeling of waiting to level up to access the quest was totally different, for me, from the feeling of being denied the opportunity to get the quest for perhaps months. In fact, after finishing up what I was doing last night I no longer had the enthusiasm that I earlier had and so logged over to LotRO to quest there. Of possibly more concern to the devs is that after subscribing and spending money in the cash shop this past weekend I was still considering spending more in the cash shop to pick up some wings, but today I no longer have the urge to spend additional money on EQ2.